Don't you just want to sit down to your dinner table this very minute thinking about a roast sized Filet Mignon? After all, that's exactly the definition of the Chateaubriand. 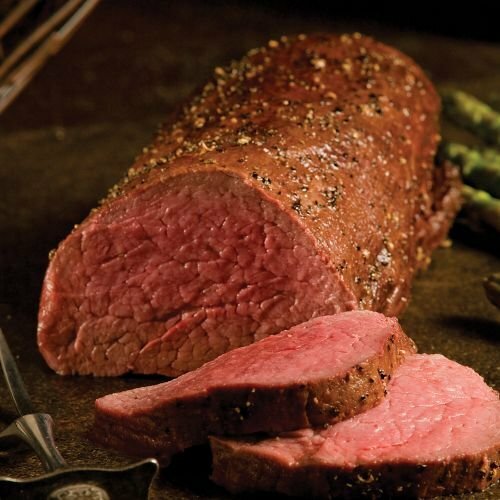 You'll savor the finest triple-trimmed Chateaubriand roast cut from our exclusive Private Reserve tenderloins. We promise you the most mouthwatering roast you've ever experienced, because this Chateau is aged to perfection for the ultimate in tenderness and flavor. When you want to entertain in grand style or thrill your family with the ultimate in dining our Private Reserve Chateaubriand is the definitive dinner. Serves 6 to 8.